MakeBread offers baking school incursions in Melbourne. Bread making has a great educational potential. It’s a fun and practical activity that teaches children about food, mathematics (sequencing, measuring, estimating, adding), science, hygiene, safe food handling, expands vocabulary and actively engages all senses. It is a real life skill and kids are thrilled to eat food they have made. 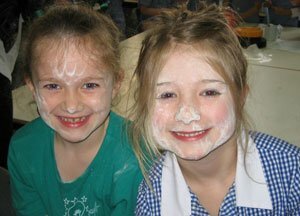 Bread making represents practical education where children are involved in the whole process rather than just being spectators. All sessions are tailored to student age and school facilities. The MakeBread incursion fitted in really well with our topic of food and culture. Vesna was very well organised and adapted the program to suit our needs. She worked with over 150 students over 2 days and each student was involved in the hands on experience of making bread. They worked through the whole process of making the dough, shaping and reshaping the bread, cooking, and then of course eating their creations. The bread looked and tasted delicious and was a great experience not only for the students, but for the teachers too. We have the Working With Children Check and Public Liability Insurance.